The Asahi Refrigerator Robot has to be the perfect summer gadget. This little guy holds in a six pack and 2 mugs all chilled and at the push of a button it opens up the can and pours you a perfect mug of beer every time. 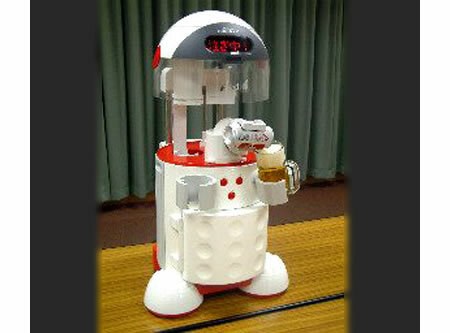 Has a few drawback though as it is not fully automated and you need to place the beer mug in its hand. Maybe ver 2.0 will come with a camera will be voice activated and when you shout the magic word “Beer” it will come walking to you and offer a chilled mug of beer.